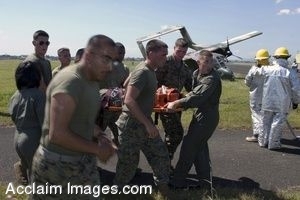 Description: Clipart photograph of U.S. Marines and members of the Philippine air force carry a Philippine air force pilot to an ambulance following an aviation mishap during joint air attack tactics training at Clark Air Base in Pampanga, Philippines, Oct. 24, 2006. The Marines, attached to Marine Wing Support Squadron One Seven Two, 3rd Marine Expeditionary Brigade, are in the Philippines participating in the bilateral training exercises Talon Vision '07 and Amphibious Landing Exercise '07, which are designed to enhance interoperability and professional relations between the U.S. and Philippine armed forces. (U.S. Marine Corps photo by Staff Sgt. Ricardo Morales). Clip art photograph by Department of Defense Public Domain.